Some games are defined by false nines. This was a match that, for better and worse, revolved around old-fashioned target men. 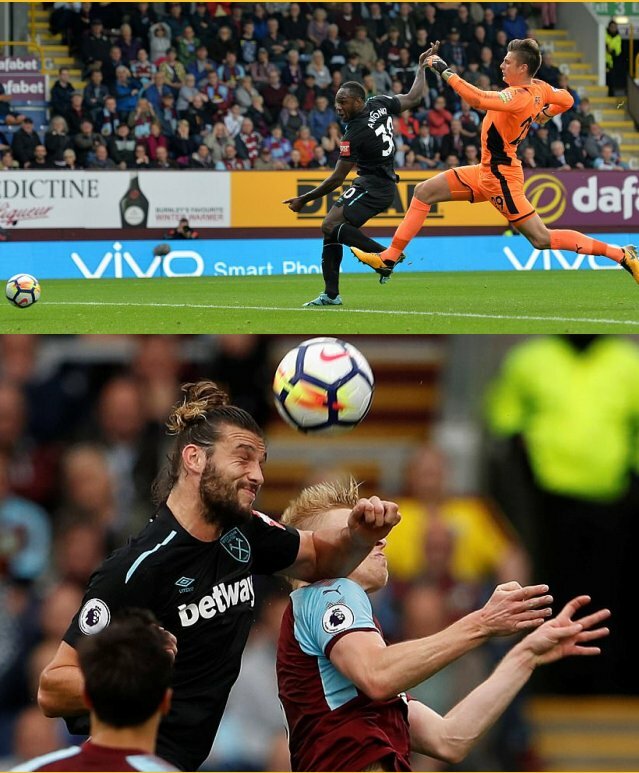 Long before Chris Wood headed Burnley’s equaliser, Andy Carroll had made a dramatic departure, dismissed for two challenges that evoked earlier eras and invited suggestions of idiocy. His Burnley counterpart ensured it eventually cost West Ham and the points were shared in a fixture some had dubbed “El Claretsico”. Not that it resembled a classic. West Ham were denied back-to-back victories, Burnley a chance to defy footballing gravity and break into the top four, if only for a couple of hours. Each, in their own way, could feel they showed spirit; typically, in Burnley’s case, and importantly, for Slaven Bilic. “I am proud of the players,” said the Croat. West Ham’s often beleaguered manager took solace from his side’s dogged determination. Pronouncing himself frustrated and disappointed, he rued the fact they needed to show such resolve. For the second time in four away league games, Bilic saw one of his supposedly destructive players show a self-destructive streak. If Marko Arnautovic’s sending off at Southampton seemed set to be the most senseless of West Ham’s season, Carroll rivalled it in a display of staggering stupidity. He collected two yellow cards in 99 seconds, both for clattering into Burnley’s centre-backs. First he elbowed James Tarkowski. Then he smashed into Ben Mee, elbow raised again. “An unbelievably bad decision,” said Bilic, faulting Carroll rather than the referee Stuart Attwell. “You are asking for trouble.” Sean Dyche concurred. “The second is possibly a straight red,” said the Burnley manager. If Carroll’s aggression felt like a throwback to another time, so did Bilic’s tactics. There was an illogical element to West Ham’s prowess; they started with a side overloaded with attackers and ended up defending valiantly, just as, when they had five forward-thinking players on the pitch, their goal was created by their goalkeeper. Pep Guardiola had his doubts about Joe Hart’s distribution but the England international recorded a rare assist, albeit with a simple punt forward. A stretching Mee missed it. Michail Antonio met it, skipped past Nick Pope and slotted a shot into the unguarded net. “A really poor goal. That is unlike us,” added Dyche, whose defence had been virtually flawless this season. Then Carroll exited. Javier Hernández, the penalty-box poacher who had been an ersatz midfielder when Bilic tried to crowbar his most potent players into a system, was then allowed to lead the line. He combined slickly with Manuel Lanzini and Antonio when the Englishman could have doubled the lead. Pope saved instead. It left Bilic lamenting the interventions of two strikers. “We defended well for 95%,” he added. “If it stayed 1-0 it would be heroic.” Instead, he was left to ponder the actions of his resident villain.